2 years warranty. Stools are available in various designs. 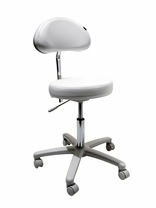 The stool is very important for correct work posture and should be comfortable. This is a purely personal choice. 2 years warranty. 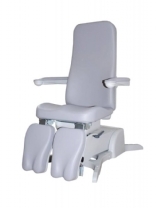 This chair is equipped with 2 actuators which make it possible to electrically adjust the height and tilting function of the chair to set it to the desired position. 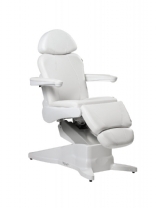 It is also possible to put the chair in massage position electrically. The back rest adjustment is easy to operate by means of a gas compression spring. 2 years warranty. 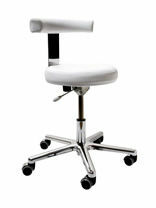 Quality and comfort were central aspects while designing this chair. The Bentlon Platinum combines a trendy design with a high seating comfort, because of the ergonomic shaped upholstery. This upholstery is made of high-quality imitation leather. 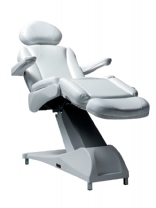 The Bentlon Platinum is also equipped with an electric leg support for extra ease of use. 2 years warranty. User-friendliness and reliability - The unique electric step-in and step-out aid lowers the chair, tilts the seat forward and turns the leg and foot section inwards. The chair has a stylish and trendy design and its ergonomically shaped upholstery ensures that your client sits comfortably. 2 years warranty. The Bentlon Podo Gold Rotate is the ideal solution for smaller practices. 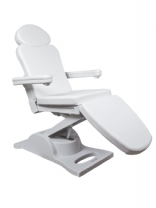 The combination of fold-able arm rests and the option to rotate allow patients to get in the chair without too much effort. The chair has 3 actuators.